Simply, we offer best of breed technology at the best prices. If you can find comparable services cheaper somewhere else, we will beat that price. 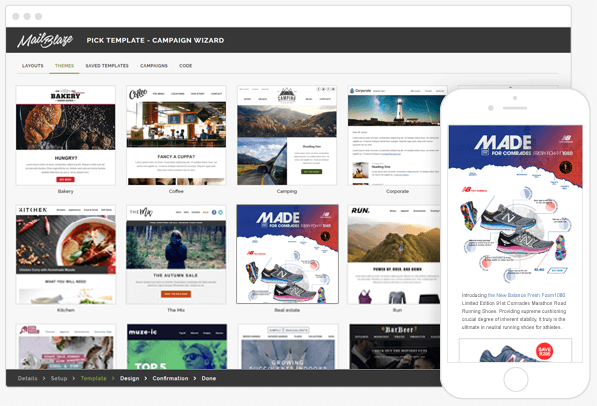 Our offering includes the latest and greatest features to help you run beautiful campaigns that will grow your business. Lastly, we care. Our comprehensive support offering guarantees that you never feel out in the cold. What is this promise about? I am so confident that our prices are lower than any other email marketing provider online, that I personally guarantee a better deal. All you need to do is email me at dino-honour@mailblaze.com with a link to the offering, and price, and I'll give you an equivalent account free for a month and at a better rate thereafter. Make sure each of your subscribers is treated as the individual they are. Personalize emails, and use advanced list segmentation and email triggers to create hyper-targeted campaigns. Not only can you choose from a range of beautifully customised templates, but all our templates have Foundation based inline CSS. This ensures they render magnificently no matter what device your subscribers use. Find out exactly how your emails are performing. Use our beautiful, easy-to-use web portal to monitor subscriber activity, links clicked, forwards, opens, geographic interaction, bounces, unsubscribes, industry benchmarking, (pre-)historic performance and trends; all through an easy to use beautiful web portal. Use Mail Blaze to send your automated system emails with ease. Simply integrate through our API and you’re away. Find out who is receiving, opening and clicking the links in your emails. The best part is it’s included in the listed price. Our system integrates with popular apps such as Wordpress, Twitter, Magento, Salesforce, Facebook, and more. We have several different ways for you to get help. Choose from one of the following methods. Browse through our knowledgebase of walkthroughs, advice and advanced email marketing techniques. Speak to one of our competent support staff dinosaurs for anything from sales to system support. Submit a question and our friendly team of expertosaurs will get back to you with a detailed answer.